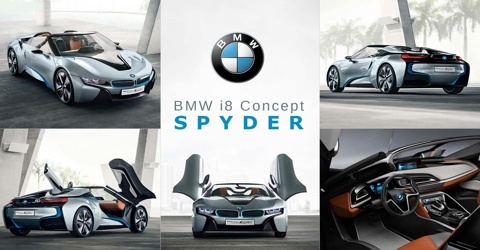 The BMW i8 Concept Spyder included a slightly shorter wheelbase and overall length over the BMW i8 Concept, carbon-fibre-reinforced plastic (CFRP) Life module, drive modules made primarily from aluminium components, interlocking of surfaces and lines, 8.8-inch (22.4 cm) screen display, off-white outer layer, orange tone naturally tanned leather upholstery. The vehicle was unveiled in Auto China 2012 in Beijing and won Concept Car of the Year, followed by 83rd Geneva International Motor Show 2013. 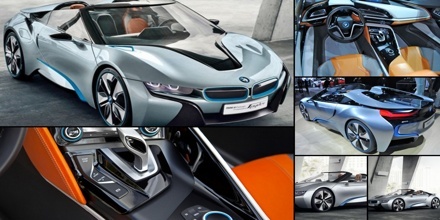 The designer of the BMW i8 Concept Spyder was Richard Kim. The Spyder has a slightly shorter wheelbase and overall length, suggesting that showroom i8s will be more compact than the concepts we’ve seen so far. It keeps the ‘swan’ doors, though, swivelling upwards despite its cabrio silhouette. It’s been enabled by the carbon-rich structure of the i8, which creates a very stiff structure. The passenger ‘Life’ cell is made from carbonfibre reinforced plastic (CFRP) while the ‘Drive’ platform underneath is made from aluminium. The lithium-ion battery is housed in the car’s spine, helping give a low centre of gravity and BMW’s preferred 50:50 weight distribution. 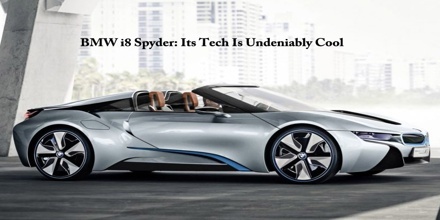 The exact release date for the i8 Spyder is not yet revealed, however, Harald Krüger, Chairman of the Board of Management of BMW AG, confirmed that the BMW i8 Spyder will arrive sometime in 2018. BMW also confirmed that the i3 will get an increase in range before the year is out. Like the i8 coupe, this car has a plug-in hybrid powertrain to produce supercar performance for claimed supermini emissions. A 129bhp electric motor drives the front wheels, while a three-cylinder turbo petrol engine sends 220bhp to the back axle. Total system output is 349bhp and 406lb ft of torque. Which explains why BMW is quoting 0-62mph in 5.0sec and a limited 155mph top speed? Yet the two-seater i8 Spyder is claimed to manage 94mpg on the European test cycle, although today’s announcement doesn’t say whether that’s the combined total figure or an economy on the easier extra-urban cycle. The i Vision Future Interaction is just one of BMW’s impressive array of concept technologies shown at this year’s CES. BMW’s “Internet of Things” technology connects the car closely to smartphones and -watches, as well as electronically controlled homes, including a “Mobility Mirror.” “Remote 3D” turns the car into a surveillance device, filming its surroundings and uploading them to the user. And the cameras are triggered when the car gets damaged or someone tries to break into it. “BMW Connected” analyzes the user’s habits and predicts their personal routes and preferences with increasing accuracy. There’s an i8 fitted with a plethora of cameras in place of mirrors, as well as “Connected Ride” motorcycle tech that includes a helmet with a built-in head-up display and a K1600GTL bike with laser headlamps. Finally, BMW is once again showing off a street lamp that serves as a charging device for electric vehicles like the i3 and plug-in hybrids like the i8. Current i8 coupe is powered by a beast, a turbocharged 1.5-liter 3-cylinder producing a whopping 362 horsepower which is able to reach 0-62 mph in a mere 4.4 seconds with a top speed of 250 km/h (155 mph). 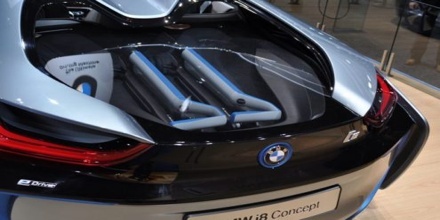 i8 Spyder is rumored to feature similar specs. The codename given for the new convertible is I15, and it will surely be the king of dynamic capability and efficiency with an exclusive aesthetic allure. BMW i8 Concept plug-in hybrid electric vehicle includes an electric motor located in the front axle powering the front wheels rated 96 kW (131 PS; 129 hp) and 250 N·m (184 lb·ft), a turbocharged 1.5-liter 3-cylinder gasoline engine driving rear wheels rated 164 kW (223 PS; 220 hp) and 300 N·m (221 lb·ft) of torque, with combined output of 260 kW (354 PS; 349 hp) and 550 N·m (406 lb·ft), a 7.2 kWh (26 MJ) lithium-ion battery pack that allows an all-electric range of 35 km (22 mi). All four wheels provide regenerative braking. The location of the battery pack in the energy tunnel gives the vehicle a low centre of gravity, enhancing its dynamics. Its top speed is electronically limited to 250 km/h (155 mph) and is expected to go from 0 to 100 km/h (0 to 60 mph) in 4.6 seconds. 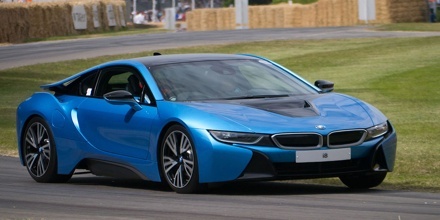 Under normal driving conditions the i8 is expected to deliver 80 mpg‑US (2.9 L/100 km; 96 mpg‑imp) under the European cycle. A full charge of the battery will take less than 2 hours using 220V. The positioning of the motor and engine over the axles results in optimum 50/50 weight distribution.